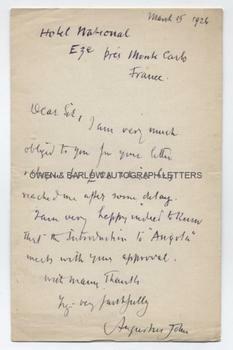 AUGUSTUS JOHN AUTOGRAPH Letter SIGNED. British (Welsh) painter. One of the principal artists of the Post-Impressionist period in the United Kingdom. ALS. 1p. Hotel National, Eze, pres Monte Carlo, France. March 15th, 1926. "I am very much obliged to you for your letter and cheque for £20 which has reached me after some delay. I am very happy indeed to know that the introduction to "Angola" meets with your approval." With good full signature. The letter is probably to the publishers, Chapman & Hall. Augustus John wrote the introduction to 'Angola: An Eastern Tale' by Jacques-Rochette De La Morliere, which was printed at the Curwen Press and published by Chapman & Hall in 1926. The cheque for £20 is presumably Augustus John's fee.